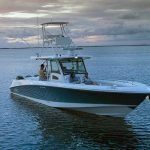 Become familiar with the handling characteristics of your boat. 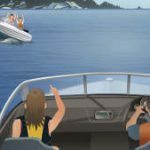 Most motorboats don’t steer very well when they lose power, and current and wind can make it even more difficult. So try and keep “way on” and your boat in motion when maneuvering in tight quarters. Practice “backing back”. On a quiet day, with no boat traffic nearby, throw something that floats into the water and practice backing up to it. Backing maneuvers are a good way to understand how your vessel “settles out” when you advance and reduce the throttle and turn the wheel. 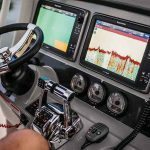 It’s never a bad idea to have someone else on your boat become familiar with the boat’s systems, communications devices, and handling characteristics. That way, if something should happen to the skipper, the vessel could return to port quickly and safely, or help could be summoned. When approaching a pier with the wind toward the shore, bring your boat slowly toward the dock space and parallel to it. The wind wind ease you in. If the wind is blowing out to sea, however, you’ll want to approach from a steeper angle, secure a bow line to the dock, and then use power to bring the stern in. If you’re leaving a dock with the wind toward the dock, leave a bow line secured to the dock and back the stern away from the dock. 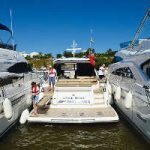 When the boat is nearly perpendicular to the dock, release the bow line and back a safe distance before proceeding forward. If the wind is blowing off the dock, just untie and let mother nature push you away. To leave the dock with the wind from dead ahead, keep a stern line attached to the dock and let the bow swing out. Then release the stern line and off you go. Try this with a friend in another boat disimilar to your own. Place your boats in a parallel configuration to each other, twenty or thirty yards apart and put your screws in neutral. Now just drift and note the difference in how the boats react to the drift. 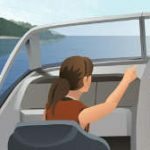 Knowing how wind and current affect your boat may prove to be helpful if you need to maneuver alongside another boat or pier. 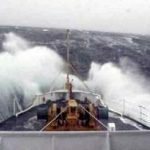 When passing an oncoming boat, and meet his wake, first you will strike the larger and longer waves of the first wave line, then, with increasing rapidity, the slower and shorter wave components. You are almost sure to be in sync with some of these groups, and they can cause discomfort and sometimes even damage. The only real defense is to slow down before meeting any large boat wake. Then, if traffic will permit, point your bow into the wake to reduce the chances of taking water . 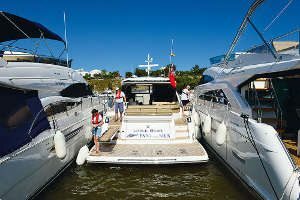 See if you can tell which skippers at your marina are experienced boat handlers by the way in which they approach the gas dock, their slip, or other boats. Then decide which end of the seamanship scale you fall within. 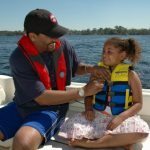 If you’re not a confident, skillful boat operator, take a boating course and ask a competent friend to show you some of the ropes.